Larry J. Sabato's Crystal Ball » Romney, Ryan, Republicans and… Eastwood? Romney, Ryan, Republicans and… Eastwood? (TAMPA, FL) — It’s common to complain that presidential campaigns are heavy on style and light on substance. That may be a fair critique, but it’s not a new one; just re-read the rather preposterous passage above, from a campaign book about William McKinley in 1896. The same sentiment that animated the pen of Murat Halstead to elevate McKinley to such Olympian heights is the same reason why, on the final night of Mitt Romney’s coronation, Republicans rolled out a number of non-politicians — including actual Olympians — to confirm Mitt Romney’s humanity. One testimonial, from an elderly couple whose terminally ill 14-year-old son Romney befriended in the months before he died, was particularly powerful. Romney worked with the boy on his will, where prized toys were passed along to friends, and he officiated at the young man’s funeral. The parents had forgotten nothing, and their unfamiliarity with the convention hall’s teleprompter made it all the more real. Anecdotes such as the ones told by non-threatening regular folks from Romney’s past should help soften his image. Imagine if the couple with the dying son had introduced Romney in network primetime. Dry eyes would have been few, in the convention hall or at home. Instead, it was campaign malpractice that the Romney managers sent out a dithering, clueless Clint Eastwood. The Romney campaign will be lucky if Eastwood’s antics don’t linger as a national punch line. Perhaps the person unhappiest with Eastwood is Sen. Marco Rubio, whose dazzling speech to his home state conclave might end up being as nationally invisible as the imaginary Barack Obama sitting in Clint’s stage chair. Romney is what he is: A relatively uncharismatic candidate who turned in a workmanlike performance on Thursday night. He’s no Rubio, but then again, he’s no Eastwood either. The whole point of his campaign is not to be the transformational leader Obama promised to be in 2008, but rather a Mr. Fix-it sewing patches on the nation’s holes. Given the state of the economy, the Mr. Fix-it role might be enough if the nation ultimately decides it wants to move on from Obama. Some of the better testimonials from the final night of the GOP convention — most notably, the speeches focusing on Romney’s role in his church — could help Romney connect with even more voters. It’s a tool he and his campaign have not tapped beyond the convention finale, and it’s one they might consider putting on TV in paid ads. A few positive spots in the midst of the negative avalanche on television might be the pause that refreshes a disgusted electorate. As a way to promote Romney, it’s certainly much more believable than describing an artist gazing in awe at the austere, lackluster face of William McKinley. We now wait to see what kind of polling bounce Romney will get out of his Tampa showcase. So far, there are few tea leaves. Daily tracking polls from Gallup and Rasmussen showed little movement over the first two days of the convention, but a daily Reuters/Ipsos tracking poll conducted during the convention was at Obama 46%-Romney 42% among likely voters before the convention, but by Thursday Romney had a 44% to 42% lead. Obviously, more time needs to pass before we can figure out how much Romney got out of his convention, and the president will of course aim to cut into any Romney gains as the Democrats kick off their convention next Tuesday in Charlotte. Convention bounces can take a few days to register. According to the RealClearPolitics average, John McCain didn’t reach his peak convention bounce until four days after his convention. The Arizonan rose all the way to 48.3% in the national polls, three points ahead of Obama. It proved to be his high water mark. We suspect Romney will at least match and probably exceed the lead McCain grabbed, but Obama has an immediate chance next week to cut into any new advantage Romney might build. If Romney does take a national polling lead on Obama, it will be his first lead since last October, again according to RealClearPolitics. Of course, McCain had the benefit of holding his convention after Obama’s confab in 2008, which is a courtesy extended to the in-power White House party. It’s worth noting that the 2008 and 2012 back-to-back conventions are exceptional. Only three times before (1912, 1916, and 1956) were the two major party conventions held so close together. Few exhausted reporters and analysts would like to see a three-fer in 2016. How about a return to standard practice? Let a few weeks pass between each convention so everyone can absorb what has happened, chew on it, and digest it. Oh, and let’s return to mid-summer conventions, while we’re at it. At the very least, we’ll avoid the heavy hurricane season. Between now and Election Day, the potential liabilities that came with Mitt Romney’s selection of Paul Ryan as his running mate could still emerge. For example, Ryan’s controversial budget, which makes changes to Medicare that Democrats energetically oppose, may yet cause damage to the GOP ticket and down-ballot candidates. But so far, the Ryan pick has produced few if any headaches for Romney while generating a great deal of positive media buzz. Ryan thrilled Republicans with his speech on Wednesday, which followed other solid primetime addresses by former Secretary of State Condoleezza Rice (whose speech predictably set off far-fetched notions of a future Condi for President campaign) and New Mexico’s Susana Martinez, the nation’s first female Hispanic governor. It helped those top-level orators not to be chained to the script of most non-primetime speakers on Wednesday — who were forced to stick to overdone references to President Obama’s “you didn’t build that” stumble. Former Minnesota Gov. Tim Pawlenty and Ohio Sen. Rob Portman, both of whom spoke before the big networks started their primetime coverage, wore bright ties but lived up to their reputations as vanilla. Yet it’s unfair to compare these vice presidential bridesmaids to Ryan. The Badger State congressman had much better material to work with. Ryan’s message was less an appeal to small business owners (the real audience for “build that”) and more an attack on President Obama for the weak economy. Despite having a reputation as a pedestrian speaker, Ryan more than passed his rhetorical test Wednesday night. Let’s not overstate the importance of Ryan’s address and overall performance as VP-nominee. This election will almost certainly be decided at the top of the ticket, unless Ryan helps deliver a decisive upset in Wisconsin and other Midwestern states. The audience for Ryan’s speech was not especially large. More than 20 million people watched the RNC between 10 p.m. to 11 p.m. on the East Coast on Nielsen-rated networks when Ryan spoke, but close to double that viewership (37 million) tuned in for Sarah Palin’s address four years ago. At the same time, it appears that the Romney campaign is getting everything it could have reasonably wanted from Ryan so far, with little to no downside. For months before the pick, we argued that the first rule of vice-presidential selection should be “first, do no harm.” Ryan seems to be satisfying that requirement at the moment, which has to be a relief to the many anonymous Republicans — most of them labeled “party strategist” — who expressed alarm about the pick when it was made a few months ago. A Florida bump from a Tampa convention? This year, both Democrats and Republicans chose to hold their conventions in states that should be competitive in November: Republicans in Tampa, FL, and Democrats in Charlotte, NC. Given that both the conventions are in swing states, we assume that both parties expect to get some electoral benefit out of holding their conventions in these competitive states. Maybe it will happen in 2012. 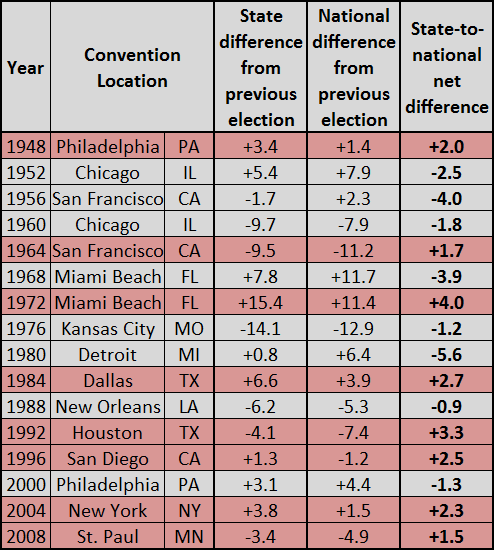 However, there’s little evidence that the location of conventions carries any electoral weight in recent history. In Chart 1, below, we examined Republican state and national two-party performance based on the location of post-World War II convention sites. The chart compares improvement (or decline) in presidential election performance based on the previous cycle’s election. If there was improvement, we looked to see if the outcome in the convention state showed greater gain than the national outcome, and if there was decline, we looked to see if the loss was smaller in the convention state. Since 1948, the GOP has performed better in the state where they held their convention than they did nationally, compared to the previous election, in eight of 16 presidential elections. But that means they fared worse in the other half of the election years. Note: Chart uses two-party vote (this eliminates all votes given to third-party candidates). Years shaded in red indicate when the Republican presidential candidate performed better in the state where they held their convention than they did nationally compared to the previous presidential election; years listed in gray indicate where they did worse in the convention state than nationally compared to the previous election. Of the examples where the Republican showing was better in the convention state than it was nationally, there are other reasonable explanations for that performance. For instance, George H.W. Bush topped the ticket in 1992, when the convention was in Houston. Did the convention help limit Bush’s losses in the Lone State State compared to the nation as a whole, or did the fact that Bush was from Texas — or some other factor — have more to do with it? Impossible to say. It’s also worth noting that conventions are often held in states that are not competitive. For instance, George W. Bush held his 2004 convention in New York City. Republicans didn’t choose the Big Apple to win the Empire State, but rather to highlight Bush’s anti-terrorism record in the first presidential election held after Sept. 11. The Republican choice of Miami Beach proved wise in 1968, as it was easy to isolate from protesters — unlike the Democratic convention in Chicago, which exploded in riots in late August. (That’s why Norman Mailer’s classic account of the two 1968 conventions is entitled Miami and the Siege of Chicago.) Richard Nixon and the GOP returned to South Florida in 1972, but that was because scandal and other problems forced the RNC to abandon the original site, San Diego. Larger campaign decisions can also explain some of the results in Chart 1. In 2008, the GOP convention was held in St. Paul, and John McCain’s electoral performance in Minnesota did not fall as much there as it did nationally, compared to Bush in 2004. But as Crystal Ball contributor Alan Abramowitz recently discussed, McCain actually outspent Obama on ads in the Land of Ten Thousand Lakes and had near-parity in terms of campaign field offices — one of the few places that Obama was out-gunned in 2008. These factors may have helped McCain blunt the Democratic edge a bit more in Minnesota than nationally. It’s possible that in one or two election years, the Republican convention might have given the party a poll boost in a convention state during the hubbub of the proceedings and shortly thereafter. That effect is likely to fade quickly, though, just as the overall convention bounces in the nation as a whole die out rapidly in most cases. Our conclusion is an easy one: For the GOP, there does not seem to be much evidence that a convention location helps a party to do better in November, and certainly not consistently. Our bet would be that the choice of convention site is a minimal factor, and perhaps completely irrelevant, in the general election results. We’ll see next week in the Crystal Ball whether the same conclusion holds for the Democrats.